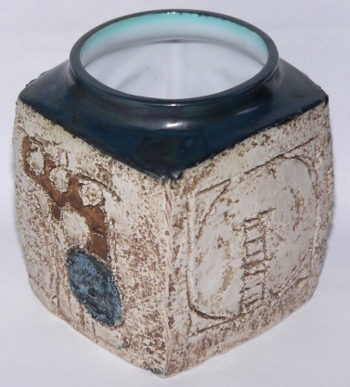 Stunning Troika pottery Marmalade vase decorated by Anne Lewis. 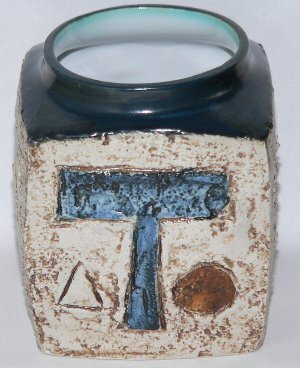 Anne Lewis worked at the Cornish pottery Troika from c1966-1972. She was with the pottery when it moved from St Ives to Newlyn, in Cornwall, in 1970. 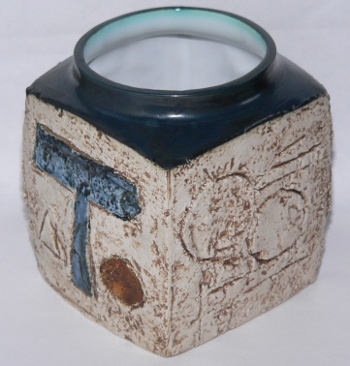 This is a textured range piece of Troika pottery finished with a deep blue glazed top. Overall it has been coloured with an oatmeal base with a very vivid blue T picked out on one side! On the base of this Troika pottery vase is the black painted Troika pottery mark, Troika Cornwall England, and the decorator's initials AL for Anne Lewis. 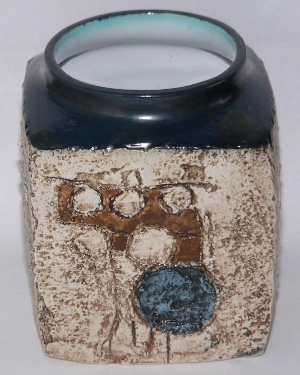 This Troika vase can be dated c1970-1972. Condition: Excellent overall condition. A lovely Marmalade vase with the collectable T design.